Hi! Writing to you from New Zealand where I came across your website. With regard to the Seagull and the idea of high-speed "flying-boats" being propelled by water propellors, I refer you to the author Rudyard Kipling's story "With the Night-Mail" an early science-fiction story (Steam-punk enthusiasts take note) about a regular airship flight across the North Atlantic. 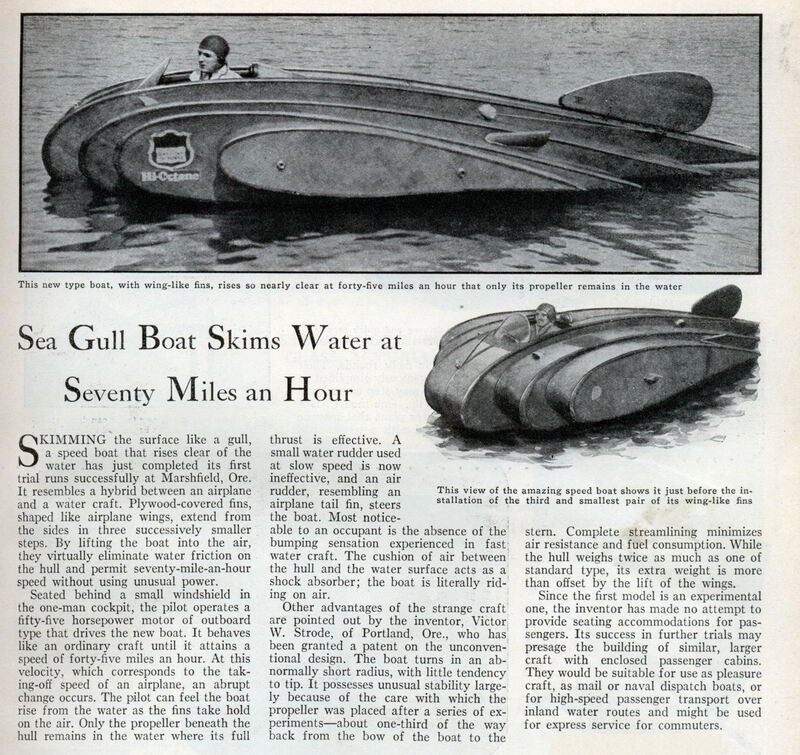 He published this story as an imitation magazine article which includes pseudo-advertisements for "Bat-boats" which seem to use the same principle as the Seagull. The story is published in Kipling's collection "Actions and Reactions" - Cheers, Mike Jackson. I don't know if anyone actually tried this but Thomas Sopwith (of Camel fame) named his first (the first) amphibious aeroplane, the Sopwith Batboat. It was a fully flying 'plane however. - Mike"
While searching the 'net for info about seagulls for the Herring Sea Gull project, way down deep into Google this fascinating little invention begged to have a cardmodel made of it. Even more fun is to study it knowing what we know some 80 years later. "This is one of the most popular sections among modellers all over the world, and is also used as an airscrew section. It has the advantage of making a wing easy to construct, and the performance has all-round merit. " "In turbulent flying conditions, Clark-Y is as good or better than modern laminar flow sections"
Clark-Y is the name of a particular airfoil profile, widely used in general purpose aircraft designs, and much studied in aerodynamics over the years. The profile was designed in 1922 by Virginius E. Clark. The airfoil has a thickness of 11.7 percent and is flat on the lower surface from 30 percent of chord back. The flat bottom simplifies angle measurements on propellers, and makes for easy construction of wings on a flat surface. The Lockheed Vega is one example of the Clark Y used in practice. For many applications the Clark Y has been adequate; it gives reasonable overall performance in respect of its lift-to-drag ratio, and has gentle and relatively benign stall characteristics. But the flat lower surface is sub-optimal from an aerodynamic perspective, and it is rarely used in new designs. Additionally, the Spirit of St. Louis and the Piper Cub use the Clark Y. The Clark Y has found tremendous favor for model aircraft, thanks to the flight performance that the section offers at medium Reynolds number airflows. Application on model aircraft is very wide, ranging from free-flight gliders through to multi-engined radio control scale models. The Clark Y is appealing thanks to its high camber, which produces a very good lift-to-drag ratio on comparatively lightweight balsa models, and for its near-horizontal lower surface, which aids in the accurate construction of wings on plans mounted on a flat construction board. The benign stalling characteristics of the airfoil are another aid, as this allows an inexperienced radio-control model hobbyist a better possibility of recovering from a stall in flight, to the benefit of the model. The depth of the section lends itself to easier wing repair, as the modeller will often then have better access to balsa structural elements. In addition, the Clark Y section's depth also permits the flush installation of what are considered "standard" sized R/C servo motors within a wing for actuation of ailerons, flaps etc. , without an excessive reduction in performance. The Sea Gull Flying Boat comes in two sizes (largest is about 10" long) with great instructions. Other flying boat models: Hansa-Brandenburg, Sikorsky S-38, Sopwith Tabloid, Piper Cub, DeHavilland Beaver, Grumman Goose, Grumman Duck, Kingfisher, and many OTHERS ! (above left) Curious how this drawing shows just two 'winglets' instead of three. (right) Perhaps the most honest image shows a 'future' Flying Gull type just house-boating around and probably not doing that too well on the narrow and flat center section. We have a wonderful (even perhaps prize-winning) Herring Sea Gull model just a click away. This model is a glider and really flys ! !